Complex systems are dynamic, and exist within broader systems that are also dynamic. This means that the effectiveness or "fitness" of a system within a bigger environment will also change over time. By definition, if an organisation ever attains the best possible fitness within an environment, any future internal or external changes will worsen that organisation's performance. The colors chosen for each aspect of fitness are quite deliberate. Traditionally, copper (performance) represents energy and vitality; silver (resilience) represents transformation; and gold (robustness) represents longevity. 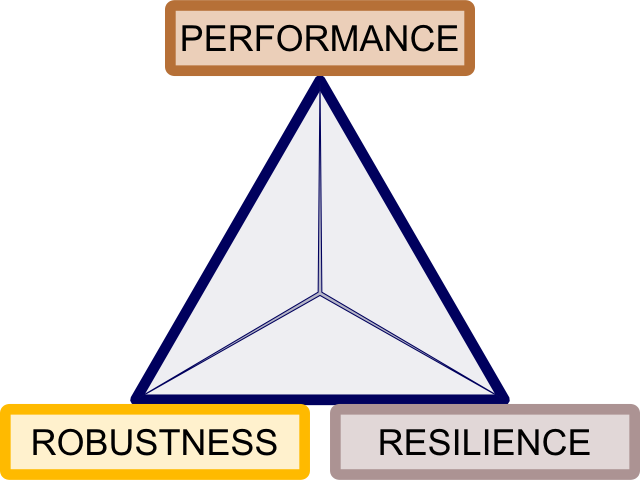 Much like the iron triangle of project management, an organisation cannot optimise for all aspects of the fitness triangle. For example, a pure focus on performance inevitably comes at the expense of either future adaptability (ie low resilience) or having the capacity to continue with "business as usual" when external or internal factors change (ie low robustness).